By its action pollen is close to the plants like ginseng, Chinese magnolia, but the healing properties of pollen surpass many herbs as the most useful substances in plants are most often in the flowers. Pollen is a product, which is produced by the so-called anthers that surround the pistil, which is in the center of the flower. 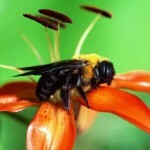 Pollination must occur so that fruit could emerge from the flower , ie, elements of the pollen, which are masculine, should fall on the stigma and grow on it. 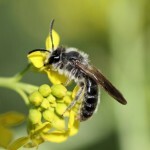 numerous insects, including bees pollinate flowers, bee whole body is covered with hair, and when bee visits the flowers infinite number of pollen grains stick to a shaggy body of bee. In order not to lose the booty, and it is easier to carry her, winged women combed pollen with special brushes in a flower or in the air while flying. This multi-colored collected powder bees treated with mandibular gland secretion, moisturizes with nectar, put in special baskets, which decorate legs of bees – pickers in the form of sticky lumps . So it turns out “leg-cover” (named for the location around the stem). 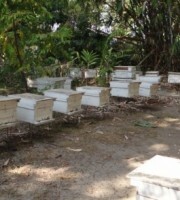 After returning to the hive, they stack up production in cell and fly again. 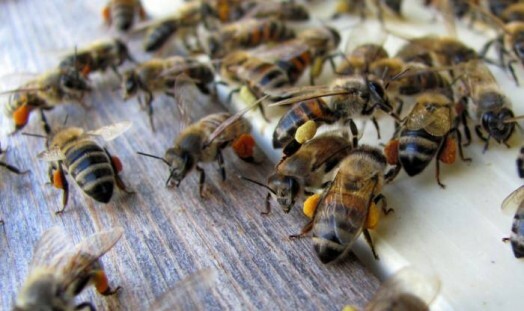 Pollen brought by bees, beekeepers selected using pollen-collectors. 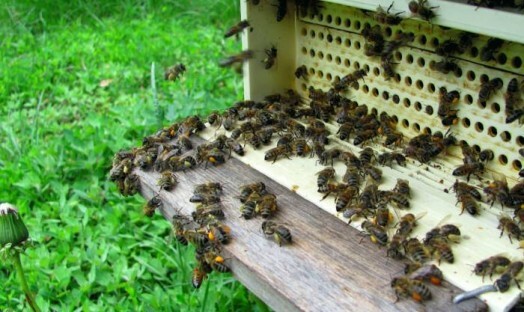 Passing through pollen-collecting grille, bees lose their pollen, which falls through the slatted floor into the tray. Water content ranges from 20%, and in rainy weather to 35% in fresh bee pollen. 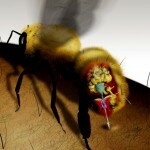 In raw bee pollen doesn’t store long and quickly deteriorates. The water content of the pollen drops drying in special ovens at a temperature of 38 – 40 degrees C (100-104 F) for 36 – 72 hours. Humidity of dried pollen should not exceed 8 – 10%, and some lumps of bee pollen should hardly crushed by fingers. Drying in the open air, in the sun or using a fan heater with a temperature above 45 degrees С (117 F) results in a sharp decrease in the nutritional value of pollen, due to the destruction of individual hormones, enzymes and vitamins. Dried pollen teirs its bright colors, but can be stored for up to two years. 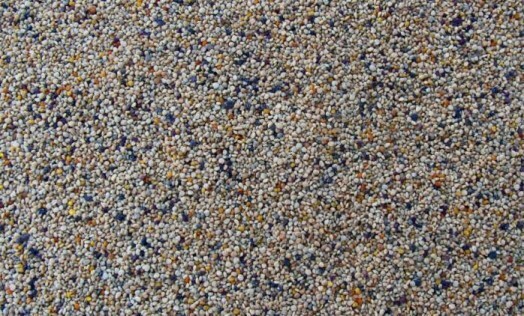 After drying, the pollen is sifted and winnowed, thereby removing impurities, wax chips and broken up pollen. 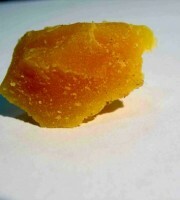 Pollen is a complex concentrate of many nutritionally valuable substances. In general, pollen contains fifty biologically active substances, which beneficially effect on the human body, and 240 useful substances . Pollen contains proteins, carbohydrates, lipids, nucleic acids, ash elements, sugars, fats, minerals, enzymes, hormones, antibiotics, almost all the vitamins and other biologically important substances. All of them are quantitatively balanced, which allows the use of pollen in the treatment of many diseases. 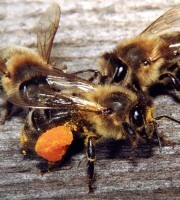 Bee pollen – one of the most important products of beekeeping. Admission of pollen improves red blood cells, white blood cells and hemoglobin in the blood, which allows its use in anemia and radiation sickness. Pollen stimulates the growth and regeneration of damaged tissues, including the liver, leads to the restoration of the liver, has choleretic, diuretic, radioprotective and antitumor activity. Pollen retards the growth of microorganisms in the intestine and regulates its function. Pollen affects the gut, dysentery and other sticks. 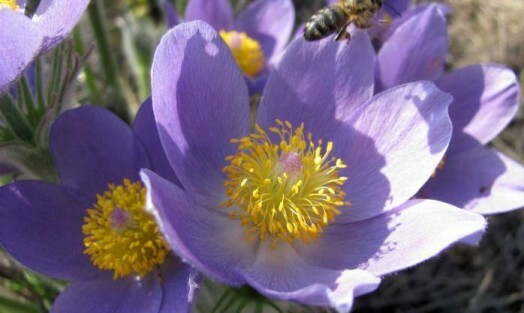 Pollen cures severe constipation, enterocolitis, intestinal dysbiosis. Normalizes the nervous and endocrine systems, activates the process of insulin cells in the pancreas,that’s why it is used in the treatment of diabetes. Pollen strengthens capillaries (particularly cerebral), reduces cholesterol, has anti-sclerotic property, causes some decrease blood clotting, that’s why it is used in the treatment of atherosclerosis and coronary heart disease, lowers blood pressure. Pollen is useful in disorders of microcirculation, slowing heart rate, urine output disorders, hematuria, glaucoma, edema, eczema, psoriasis, and the normalization of the psyche. Pollen affects recovery of metabolism in aging, being, in fact, the elixir of youth. By acting on the immune system, pollen strengthens the body, increases the appetite, restores and increases the weight of the body, improves mental and physical performance. Pollen is used for gout to reduce uric acid levels. Pollen collected from different plants has different medicinal properties. Pollen – good and strong biodyne gerontological agent. 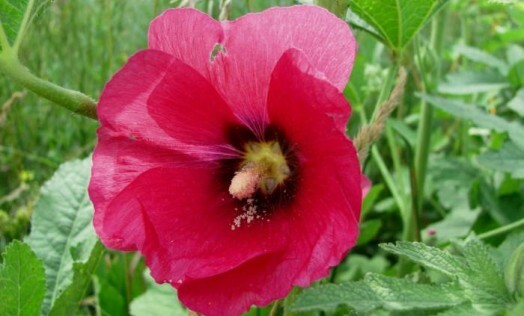 The use of pollen increases the percentage of hemoglobin in the blood, causing appetite, cheerfulness. Pollen in combination with honey (in a weight ratio of 1:1 and 1:2 of honey) has been successfully used in hypertension, as well as diseases of the nervous and endocrine systems. Pollen is useful for impaire people who have had infectious diseases, as well as patients in the postoperative period. Pollen, in combination with other medications, enhances their effect, can reduce their dose, and sometimes replaces. Medicinal mixture and some recipes. 1) 60 g of pollen and 300 g of honey (dissolved). Stir, put in the dark dishes and store at room temperature. A week after the fermentation the mixture can be used, stir before using. Take 2-3 times a day for 1 st. spoon 15-20 minutes before eating. 2) 20 g of pollen, 75 grams of fresh aloe, 500 g honey. Initially stir pollen and honey, then add the mixture to the fresh aloe juice, stir. Store in a cool dark place. Take 1 teaspoon 2-3 times a day 15-20 minutes before eating. Treats chronic and atonic disorders of the gastrointestinal tract, gastritis with insufficient acidity. 3) 10 g of pollen, 50 g of honey, 100 g of fresh milk, stir. Take 1 teaspoon 3 times a day before meals with anemia. The treatment of these mixtures – 1-1.5 months, then take a break for 2-3 weeks. If necessary, repeat. Colitis, enterocolitis, chronic diarrhea (treatment of pollen). Pour 800 ml. cold boiled water in enamel ware , dissolve in it 180 g of natural honey and add 50 g of pollen with constant stirring. The resulting mixture stands for several days at room temperature. Take half a cup or two-thirds of cup 3 times a day before meals for 1-1.5 months. In these diseases, you can also eat raw pollen one teaspoon 3 times a day before meals for 1-1.5 months. Chronic gastritis, duodenitis, cholecystitis, spastic colitis (treatment with pollen). Take 10 g of pollen for 20-30 minutes before meals three times a day for 20 days. Gastritis in violation of the secretory function, chronic pancreatitis, chronic nephritis (treatment of pollen). Take 1 teaspoon of pollen for 15-20 minutes before meals two times a day for 1.5 months. 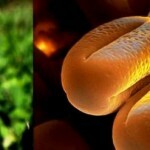 Liver disease (treatment of pollen). Teaspoon of pollen mixed with a tablespoon of honey and take in the afternoon. Treatment duration 1-1.5 months. Hypertension (treatment of pollen). Pollen and natural honey in the ratio of 1:1 or 1:2, mix well and take one teaspoon three times a day before meals for 1.5-2 months. Functional disorders of the cardiovascular and autonomic nervous systems (treatment of pollen). Take 10 g of pollen for half an hour before meals 3 times a day for 20 days. Chronic kidney disease (treatment of pollen). Mix pollen and honey in the ratio of 1:1. Take a teaspoon 3 times a day, dissolving in the mouth. Course – 1.5 months, after a two week break, repeat the treatment. Senile weakness (treatment of pollen). Eat pollen, one teaspoon drinking milk for 15-30 minutes before eating, 3 times a day for 1-1.5 months. Peptic ulcer and duodenal ulcer, gastritis with high acidity (treatment with pollen). 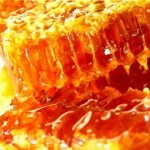 Mix pollen and honey in a 1:1 ratio, dilute dessert spoon of mixture into 50 g of boiling water and infuse for 2-3 hours. Take warm tincture (it helps to reduce acidity) one dessert spoon 3-4 times a day. The course of treatment – 3 – 4 weeks. The result will be better if you take additional infusions of herbs shown in peptic ulcer and gastritis with high acidity. Gastritis with low acidity (treatment of pollen). Mix pollen and honey in the ratio of 1:1 and dissolve a dessert spoon of the mixture in 50 g of warm boiled water, leave for 2-3 hours. Drink it cool, which promotes the release of stomach acid and high acidity, 3 times a day before meals. Treatment 1 month. After a 10-day break to repeat the course. You can enhance the effectiveness of treatment receiving infusions of herbs shown in gastritis with low acidity. In anemia (treatment of pollen). Take 0.5-1 teaspoon of pollen three times a day, 15-20 minutes before meals. The course of treatment – 1 month, if necessary, it will be repeated after a 1-2-week break. With neurosis, neurasthenia (treatment with pollen). Take 0.5-1 teaspoon of pollen, depending on the patient’s weight, the best is 3 times a day 20-30 minutes before eating. The course of treatment is 2-3 weeks. More effective mixture of pollen and honey in the ratio of 1:1. you should pour some water for 2-3 hours as pollen, and the mixture, and then take. Tuberculosis (treatment of pollen) – take 1 teaspoon of pollen three times a day, children dose is reduced to 1/3-1/2 teaspoon. The course of treatment – 30-45 days. Chronic kidney disease (treatment of pollen). 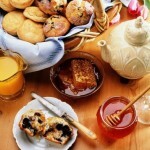 Pollen mixed with honey in a 1:1 ratio, take it 1 teaspoon or dessert spoon 3 times a day 20-30 minutes before eating. 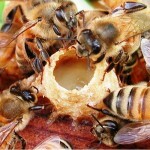 Pollen and honey pour in 50-100 ml of boiling water for 2-3 hours, then drink. The course of treatment 1.5 months. After a 2-week break, he repeated. Very good time to drink herbal fees shown in the above mentioned diseases. 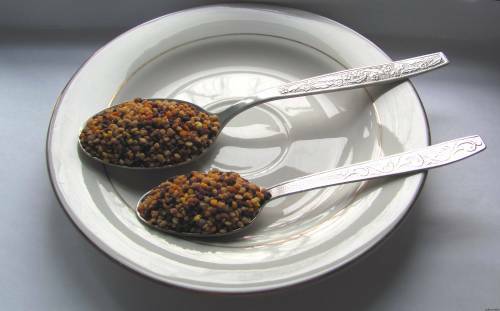 Weight of one teaspoon of bee pollen is 7 grams, and a teaspoon of bee pollen weighs 11 grams. 1. 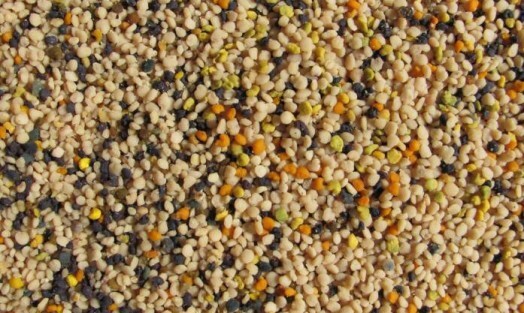 Try to buy natural bee pollen collected by bees directly. 2. Buy flower bee pollen from the manufacturer - this will give you absolute confidence in the quality, ie, the biological activity of the product. 3. 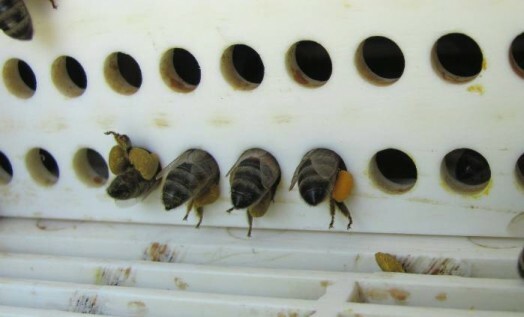 Pollen, that is bought from random people in the markets, may actually not be effective, since more often it does not met the conditions and temperature during processing. 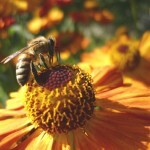 As a result, the useful properties of pollen can be partially or completely lost. 4. 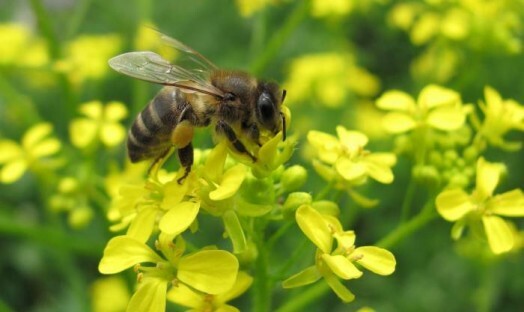 Pollen that is sold in pharmacies in the form of dietary supplements, and the more Chinese pollen, has nothing common with real pollen of bee, and many biologically active substances are simply not available. 5. You necessarily dissolve pollen in the mouth. 6. 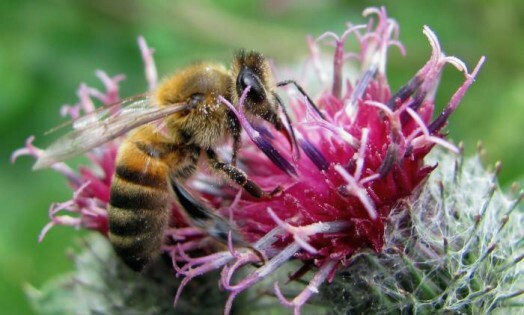 Some collect pollen has a bitter taste, so we recommend using it with honey. 7. After receiving pollen it is advisable not to drink or take any liquid for 15-20 minutes. If you follow these simple rules, the use of natural bee pollen can provide you not only with vitamins and trace elements, but also can help prevent and cure some diseases. Pollen should be stored in a clean, dry place at temperature above +20 ° C (68 F) and humidity of 75%, in a tightly sealed container or packaging, as it is hygroscopic, it absorbs very quickly moisture from the air and comes in a full disrepair. 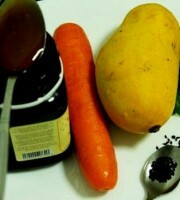 It can be stored in the refrigerator in the vegetable compartment for two years. Contraindications for the use of the flower, bee pollen – there are not! Maybe you know where I can buy raw bee pollen?